Justin Paxton and Hillard Miller were both trying to win their second late model feature of the year at Oakshade Raceway Saturday night, but in the end it was the 2001 Late Model Track Champion, Justin Paxton, that was the first to the checkered flag. Ron Miller jumped out to the early lead after starting on the outside of the front row. Hillard Miller moved up three positions to run second. Hillard Miller took the lead on lap five and looked to be the car to beat for much of the race. Unfortunately for Hillard, the 34 car of Justin Paxton continued to close in on the leader moving up though the field to second. Casey Noonan and Jerry Bowersock tangled in turn two while battling for third on the 18th lap knocking both drivers out of contention. After putting a lot of pressure on Hillard Miller for the lead for a few laps, Justin Paxton squeezed by on the outside taking the lead with five laps remaining. Paxton went on to win his second late model feature of the year and Hillard Miller held on to a second place finish. Rusty Schlenk finished third with Ron Miller taking fourth. Former bomber driver John Bailey who moved up the to the sportsman division this year, found himself leading the first half of the sportsman feature. Ray Klawitter started mid-pack and worked his way through the field taking the lead from Bailey on lap eight. Brad Kendall took second away from Bailey a couple laps later and began to close in slowly on Klawitter who had opened up a big lead. Kendall was able to catch Klawitter on the final lap getting the inside in the final corning coming to the checkered flag, but Klawitter had the advantage coming off turn four up high and held on to win his fourth sportsman feature of the year. Joe Derbeck finished third behind Kendall and Tim Shelley and John Bailey rounded out the top five finishers in the sportsman feature event. The bomber A Main produced a lot of excitement early with numerous cautions keeping the field tight. Gary Domoe led the first nine laps of the race until last week’s bomber A Main winner George Laney took control. Brice Luttrell closed in on the leader in the final few laps and the two had a pretty good battle for the lead often running door to door, but in the end it was the driver from Toledo, George Laney, that held on for his second straight A Main win. Luttrell settled for second and was followed by Domoe, Jim Scout and Todd Silvey. Oakshade flagman Bud Howell was hit in the stomach with some debris during the race and was tended to by the medical staff, but he was not seriously injured. Joseph Nickloy led the bomber B Main flag to flag holding off a challenge from last week’s B Main winner Tom Ordway. Chuck Leininger finished third behind Ordway and Gordon Digby took fourth. The bomber C Main started off with a bang after Ben Thomas smacked the front stretch wall resulting in a complete restart. Curtis Lancaster took control of the race opening up a big lead on the rest of the field, but Rich Risner began to close in toward the end of the race. Risner ran out of laps and settled for second with Curtis Lancaster picking up the victory. The final event of the night was the bomber D Main in which Chad Zuver took the lead on lap three from Mike Patton and then drove away. Zuver won easily with a good battle for second between Mike Patton and Ron Tolles. Patton held on to finish second after Tolles spun coming out of the final corner. Craig Dippman finished third followed by Jeff Potridge and Jim Guinn. Tolles slipped back to finish sixth. 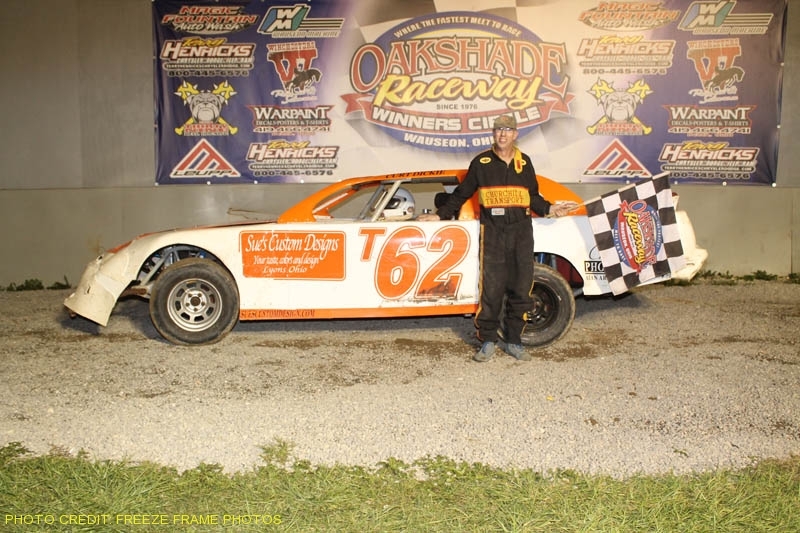 Next week, Oakshade Raceway will once again feature late models, sportsman/trucks and bombers.